The late and very respected Mary Roslin Williams talked about the field trail labs having been cross-bred with both greyhounds, border collies, pointers and others to optimize speed and hunting functions. I cannot find anything about this online, does anyone have information about this? I do not doubt it given the looks of certain so-called labs.. Anywhere I've seen mention it lists MRW as the source of that information. If she it happened, then it surely did. Keep in mind that, back at the beginning of the Labrador Retriever, purebreds were a fairly unusual notion. Dogs were for working for many folk, and what worked was kept. Remember that the word "collies" comes from black or coal, as well as from black-faced or coal-faced sheep. Labrador type dogs were a land race in Canada. Back in England, lurchers were often Border Collies crossed with greyhounds or whippets, good for putting rabbit meat, etc. in the larder. 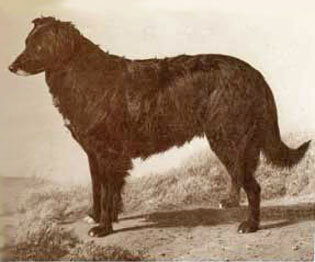 "The St. John’s water dog, the Newfoundland, the true Newfoundland, the Newfoundland water dog, the Lesser Labrador, the Lesser Newfoundland, the wavy-coated retriever, the old flat-coated retriever, or the Labrador are all names that refer to this sort of dog that was widely distributed on Newfoundland. It later would become a global phenomenon. It would be crossed with many things, and it would have a major impact upon several very different dog breeds. "In the British Isles, it was widely celebrated as the basis for the newly establishing retriever strains– and I’ve written about this quite a bit on this blog. "The Newfoundland, the Labrador, and the St. John’s dogs have this peculiarity—they not only possess sagacity, but they disseminate it through any number of crosses, or at least through a great number of them. On this account their breed has been used almost universally in improving Retrievers, and with great success. Some of,the best shepherds I have ever met with have told me that their favourite breed of Sheep Dog was descended from Labrador and Colley; and I have been solicited by them, and never in vain, for the services of my most intelligent Retrievers, to put more sense into Sheep Dogs, already showing distinctly the Newfoundland mixture. –The Rev. Thomas Pearce The Dog: With Directions for His Treatment (1872). "Perhaps this might explain why so many border collies are either black and white or liver and white, two colors that were quite common in the Newfoundland dog family. "Gypsy, one of Queen Victoria’s collies, looks very much like a golden retriever/border collie cross. "Collies of this type could have founded the St. John’s water dog type, or they could have been descended from it. Genetic studies show that border collies are not more closely related to the retrievers, but they may have experienced an occasional outcross at the time of Idstone’s writing. Collies of this type were definitely crossed into retrievers, but it is unclear if these collies contributed much to modern collie breeds." Last edited by Charlotte K.; 06-23-2014 at 04:16 PM.